Imaginary line fixed upon as the one along which the reckoning of the calendar day changes. East of this line the day is dated one day earlier than the west of it. The date-meridian involves many Jewish questions, such as fixing the Sabbath and the holy days in the Jewish calendar, counting the days of mourning, and dating documents. 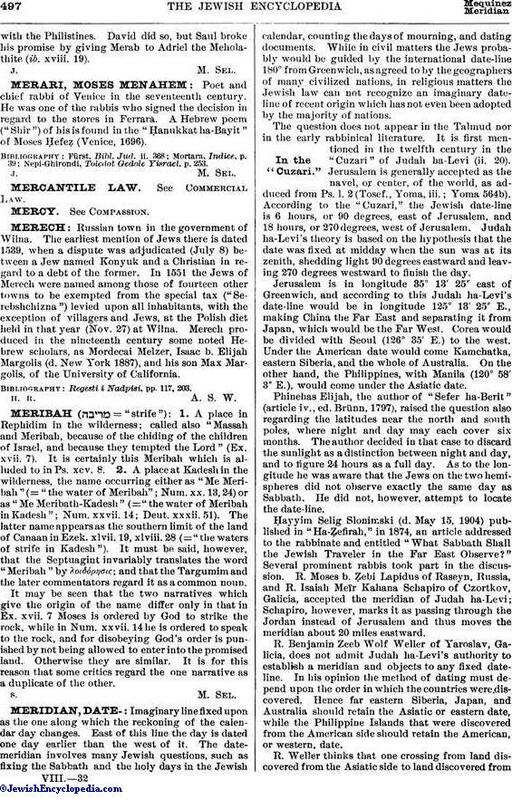 While in civil matters the Jews probably would be guided by the international date-line 180° from Greenwich, as agreed to by the geographers of many civilized nations, in religious matters the Jewish law can not recognize an imaginary date-line of recent origin which has not even been adopted by the majority of nations. The question does not appear in the Talmud nor in the early rabbinical literature. It is first mentioned in the twelfth century in the "Cuzari" of Judah ha-Levi (ii. 20). Jerusalem is generally accepted as the navel, or center, of the world, as adduced from Ps. 1. 2 (Tosef., Yoma, iii. ; Yoma 564b). According to the "Cuzari," the Jewish date-line is 6 hours, or 90 degrees, east of Jerusalem, and 18 hours, or 270 degrees, west of Jerusalem. Judah ha-Levi's theory is based on the hypothesis that the date was fixed at midday when the sun was at its zenith, shedding light 90 degrees eastward and leaving 270 degrees westward to finish the day. Jerusalem is in longitude 35° 13' 25" east of Greenwich, and according to this Judah ha-Levi's date-line would be in longitude 125° 13' 25" E., making China the Far East and separating it from Japan, which would be the Far West. Corea would be divided with Seoul (126° 35' E.) to the west. Under the American date would come Kamchatka, eastern Siberia, and the whole of Australia. On the other hand, the Philippines, with Manila (120° 58' 3" E.), would come under the Asiatic date. Phinehas Elijah, the author of "Sefer ha-Berit" (article iv., ed. Brünn, 1797), raised the question also regarding the latitudes near the north and south poles, where night and day may each cover six months. The author decided in that case to discard the sunlight as a distinction between night and day, and to figure 24 hours as a full day. As to the longitude he was aware that the Jews on the two hemispheres did not observe exactly the same day as Sabbath. He did not, however, attempt to locate the date-line. Ḥayyim Selig Slonimski (d. May 15, 1904) published in "Ha-Ẓefirah," in 1874, an article addressed to the rabbinate and entitled "What Sabbath Shall the Jewish Traveler in the Far East Observe?" Several prominent rabbis took part in the discussion. R. Moses b. Ẓebi Lapidus of Raseyn, Russia, and R. Isaiah Meïr Kahana Schapiro of Czortkov, Galicia, accepted the meridian of Judah ha-Levi; Schapiro, however, marks it as passing through the Jordan instead of Jerusalem and thus moves the meridian about 20 miles eastward. R. Benjamin Zeeb Wolf Weller of Yaroslav, Galicia, does not admit Judah ha-Levi's authority to establish a meridian and objects to any fixed date-line. In his opinion the method of dating must depend upon the order in which the countries were discovered. Hence far eastern Siberia, Japan, and Australia should retain the Asiatic or eastern date, while the Philippine Islands that were discovered from the American side should retain the American, or western, date. R. Weller thinks that one crossing from land discovered from the Asiatic side to land discovered fromthe American side, or vice versa, must observe both his own Sabbath and that of his neighbors to make sure of the right date. 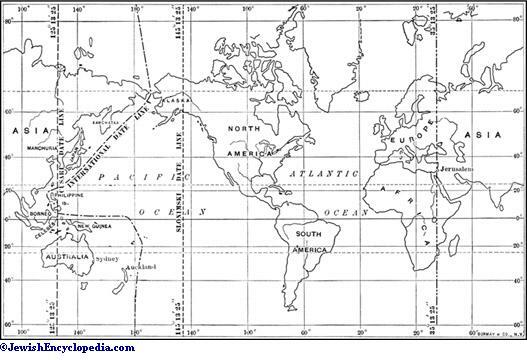 The "natural" meridian, as R. Weller calls it, was criticized as impracticable, since discoveries of islands in the Pacific might be made from opposite coasts in such a way as to carry the Asiatic date farther west and the American date farther east. Slonimski, after reviewing the opinions of the rabbis, accepts Judah ha-Levi's view as to the location of the meridian at Jerusalem, which he advocates both from the Jewish-national and from the geographical standpoint. But he divides the distance equally, allowing 180 degrees on each side. According to his view, the date-line would be in longitude 145° 13' 25" west of Greenwich. 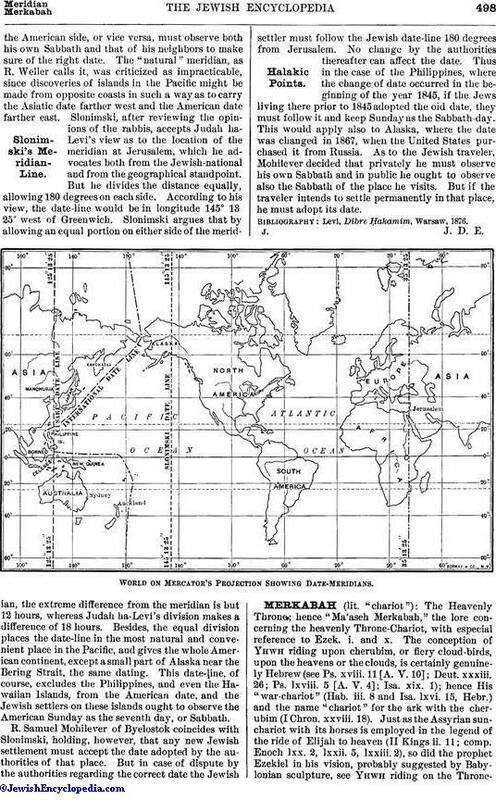 Slonimski argues that by allowing an equal portion on either side of the meridian, the extreme difference from the meridian is but 12 hours, whereas Judah ha-Levi's division makes a difference of 18 hours. Besides, the equal division places the date-line in the most natural and convenient place in the Pacific, and gives the whole American continent, except a small part of Alaska near the Bering Strait, the same dating. This date-line, of course, excludes the Philippines, and even the Hawaiian Islands, from the American date, and the Jewish settlers on these islands ought to observe the American Sunday as the seventh day, or Sabbath. R. Samuel Mohilever of Byelostok coincides with Slonimski, holding, however, that any new Jewish settlement must accept the date adopted by the authorities of that place. But in case of dispute by the authorities regarding the correct date the Jewish settler must follow the Jewish date-line 180 degrees from Jerusalem. No change by the authorities thereafter can affect the date. Thus in the case of the Philippines, where the change of date occurred in the beginning of the year 1845, if the Jews living there prior to 1845 adopted the old date, they must follow it and keep Sunday as the Sabbath-day. This would apply also to Alaska, where the date was changed in 1867, when the United States purchased it from Russia. As to the Jewish traveler, Mohilever decided that privately he must observe his own Sabbath and in public he ought to observe also the Sabbath of the place he visits. But if the traveler intends to settle permanently in that place, he must adopt its date. Levi, Dibre Ḥakamim, Warsaw, 1876. World on Mercator's Projection Showing Date-Meridians.